Turkey – Europe: Privileged partnership – less democracy? EU-Turkey accession negotiations are at a dead end. Important EU countries are against Turkey’s EU accession, while in Turkey there is a nationalist backlash that makes conceivable the choice of other options, different from Turkey’s further Europeanisation. European politicians have proposed as ‘Plan B’ ‘privileged partnership’. The disadvantage of the latter is that Europe would lose an instrument of control that until now has facilitated the effective establishment of democracy and rule of law in Turkey. In this article, Jens Alber looks at ten frequently asked questions about Turkey’s EU membership. His study, based primarily on opinion polls, shows that while the Turks differ from the Europeans in many respects, the differences between educated urban groups and the rural population as well as between younger and older people in Turkey are remarkably insignificant. Hence, Turkey’s EU accession will no doubt lead to even greater economic and cultural heterogeneity in Europe. On the other hand, the Turks support democratic rights and freedoms almost as much as the Europeans and, in their overwhelming majority, are in favour of joining the EU. Using the example of the Federal Republic of Germany’s integration into the West after the Second World War, which shows that value orientations and cultural models can change very quickly under pressure of new foreign-policy obligations and relations, the author argues for the admission of Turkey to the European Union. This would strengthen civil liberties and pro-Western elements in the country, thus contributing to the further spread and consolidation of West European democratic values. The change in the social climate in Germany regarding Islam after 11 September 2001 is clearly visible in the development of official and unofficial discourse on Islam and Muslims. This research shows that there is a growing differentiation of Muslims in discursive practices: Islam is increasingly thematised in the context of terrorist attacks; on the whole, the image of Islam is deteriorating. Although the image of Islam found in public discourse in Germany before 9/11 was moderate, it highlighted the foreignness of Muslims. However, the changes in the way the image of Islam is constructed in public discursive practices in Germany do not justify the claims that there are widespread anti-Muslim sentiments in German society. Despite the existence of negative attitudes on both sides (Christians and Muslims), the level of mutual acceptance and trust remains high. This article discusses different arguments for and against Turkey’s EU membership in the context of the debate on European identity. It begins by identifying several problem areas: firstly, in culture, the heritage of Christianity and its connections with ancient philosophy and Roman law; secondly, in politics, the separation of church and state, and the rise of free towns and cities; thirdly, in the economy, the development of organised capitalism. Against this background, Turkey’s connection with Islam and the burden of its specific imperial past, strong nationalism and geopolitical ambitions, the size of its population and social polarisation of society, are generalised to the conclusion that Turkey’s accession would overstretch and destroy the EU project. The rise of tensions between the West and the Muslim world is often reflected in public opinion polls, which reveal a fear of Islam in the West and a deep resentment in many Muslim countries against the West and the USA in particular. It is ironic that at a time when globalisation is transforming the world into a ‘global village’ there is an ever-widening gulf of misunderstanding and a kind of ‘iron wall’ composed of deep prejudices and myths emerging between the West and the Muslim world. What is the meaning of these developments for EU-Turkish relations? What might be the impact of EU-Turkish relations on the broader issues of dialogue between the West and the Muslim world? This paper addresses these questions and argues that the very fact that Turkey is negotiating its membership in the EU and that there is still the possibility that Turkey may become a member of an otherwise overwhelmingly ‘Christian club’ ought to be a truly welcome effort to bridge this gulf and overcome this new ‘iron wall’. Strained relations with the EU and declining public support for accession in Turkey did not prevent the ruling Justice and Development Party (AKP) from winning the parliamentary elections by a landslide and getting its nominee elected as president in 2007. However, the debate on Turkey’s place in Europe and on Europe’s attitude towards the Turkish candidacy for EU membership is continuing. The paradoxes of Turkey’s European integration were projected in an interesting way in the events of 2007, which are examined in detail in this article. A review of the details and nuances of the AKP’s election victory explains why many were surprised by the loss of the traditional left- and right-wing parties. The specific nature of political processes in Turkey, which do not lend themselves to standard and unambiguous judgement, includes a bitter struggle for power between the traditional defenders of the secular republic and a party on the rise which identifies itself as liberal, democratic and pro-European even though it has its roots in ‘political Islam’. On the other hand, the circles which are expected to support Turkey’s European integration are increasingly taking conservative, nationalist and/or anti-European positions. The article looks at what the AKP stands to gain from applying the methods of democracy as well as at how the conditions were created for the rise of a political party which Euro-sceptics regard with bias and caution. Turkey’s dilemmas do not stem from the severity of its problems, as precisely the things that any outside observer would point to as assets are the things that actually cause internal tensions. The question of the EU is a litmus test and a divisive force dividing society vertically – dividing each institution or group of people in Turkey into those who are for and those who are against joining the EU. For the first time in Turkish history, certain circles which are determined to stop the process of EU integration are seeking an alliance between themselves and the plebeian, street nationalism, to create a picture of massive resistance to EU accession and a massive mobilisation around the national ideals and symbols. That is why for the first time in Turkish history, the state will have to accommodate itself to society rather than the other way round. Joining the EU necessarily means a radical democratisation of the political structure, which in Turkey means, before anything else, ending the ‘military democracy’. A return to normal conditions would make possible a compromise between the government and the military and, by extent, the long expected compromise between religion and secularism. This article analyses briefly the widespread view that religiosity is the main problem for democracy in Turkey. As a counter-argument, it raises the question of the continuing presence of the military in Turkish politics, which is often legitimated with the need to guarantee ‘Turkey’s secular character’. The author analyses the problems stemming from the ideology and policy of ‘laicism’. He defends the thesis that democratisation and liberalisation of Turkish society require, inter alia, lifting a series of restrictions on religious activities. The latter cannot be viewed automatically as a threat to Turkey’s secular character, and even less as a threat to democracy in the country. 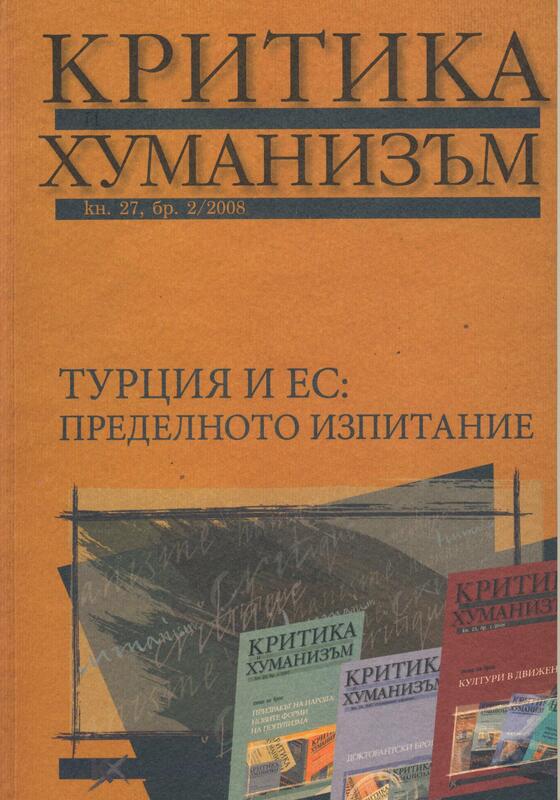 In view of the opening of EU membership negotiations with Turkey on 3 October 2005, this text deals with the debates on the country’s accession to the Union conducted to date both in the European countries and in Turkey itself. The main point of reference are the concepts of European identity that can be derived from the European and Turkish debates. A distinction is made between two lines of argument: on the one hand, the aspect of Turkey’s ‘cultural compatibility’ and, on the other, the aspect of ‘political conditionality’. Some problems that may arise from this both for the future of Europe and for Turkey’s future accession are examined. An additional excursus briefly outlines the peculiarities of the Greek perspective on Turkey’s EU membership. This article argues that the national debate in Bulgaria on Turkey’s accession to the EU is more instrumental than political, and tends to build a particular political identity for the political actors involved. Bulgarian political parties use the debate in order to differentiate themselves from other parties or to demonstrate closer positions to their European political partners. But despite this obvious instrumental approach, the arguments used by the actors reveal their more general views on the nature and the future of the European Union: Should it become a kind of new superpower, or will it grow as a model of an integrated multicultural society or remain only a club of Christian countries? These are quite different political projects and expose different political identities.